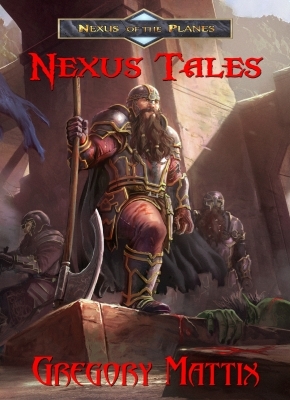 Journey deeper into the planes with this collection of short fiction featuring earlier adventures of the heroes of the Nexus of the Planes trilogy, along with an introduction to Dakarai Creel, a major new character from the upcoming successor series to Nexus of the Planes. Nera and Arron get more than they bargained for when they journey to a rain-soaked plane and attempt to steal a magical dagger from a mage. Their mission seems simple enough, but their luck runs out when they are captured and sent to the gallows. Waresh Hammerhelm leads an expedition to retake Torval’s Hold, a fabled stronghold that fell under mysterious circumstances centuries earlier, in a bid to discover a truth buried in the past and win the respect of his father, the king. Nera, Arron, and Wyat’s search for the cause of the slaughter of a village leads them to an isolated monastery where they learn of an ancient curse unleashed. Time is running out to prevent the evil from spreading. Dakarai Creel is a monster hunter, a fugitive of Nexus, and a lone traveler who wanders the realms and pits his sword and wits against the evil creatures the law has no means or interest in dealing with. He takes on a contract to find some missing villagers who are disappearing one by one, but how can he fight a malevolent killer who hides in plain sight and leaves no trace? More of the past and motivations of the two retrieval officers, Haskell and Vhijera, are revealed in two intertwining tales of high adventure. Now available on Amazon. Read for free with Kindle Unlimited!